2. Any structure of angular shape resembling a flexed knee. 1. genu; the area around the articulation of the femur and tibia. 2. any structure resembling this part of the leg. 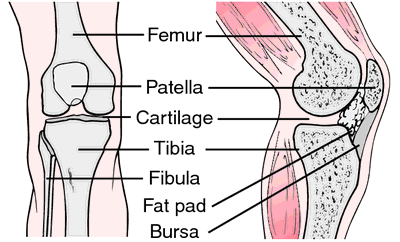 housemaid's knee inflammation of the bursa of the patella, with fluid accumulating within it. 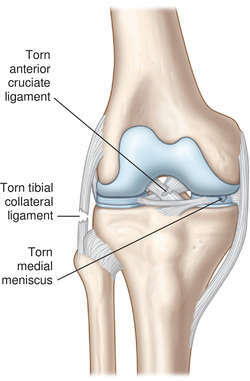 trick knee a popular term for a knee joint susceptible to locking in position, most often due to longitudinal splitting of the medial meniscus. a joint complex that connects the thigh with the leg. It consists of three condyloid joints, 12 ligaments, 13 bursae, and the patella. The motion of this joint is not a simple gliding motion because the articular surfaces of the bones involved are not mutually adapted to each other. Various orthopedic conditions such as arthritis commonly affect the knee, especially in elderly individuals. The knee is relatively unprotected by surrounding muscles and is often injured by blows, sudden stops, and turns, especially those associated with sports. 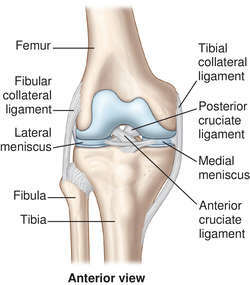 Ligament tears of the knee joint are extremely common in athletes and produce a variety of signs and symptoms, such as effusion, varying degrees of edema, differences in the shape of the knee joint, tenderness on palpation, crepitation, instability of the knee joint, and possible ecchymosis. Torn menisci are very common sports injuries and can cause severe pain, limping, edema, and greatly reduced motion. 1. Synonym(s): genu (1) . A colloquial term for internal derangement of the knee joint, characterized by pain or instability, locking, and weakness. It is usually the result of a torn internal cartilage, a fracture of the tibial spine, or an injury to the collateral or cruciate ligaments. The knee should be immobilized with a posterior splint. Arthroscopy and/or magnetic resonance imaging may be necessary for a definitive diagnosis. The curve at the meeting place of the anterior and posterior limbs of the internal capsule of the brain. A colloquial term for an overuse syndrome, marked by chronic inflammation and infrapatellar tendonitis, resulting from repetitive jumping or leg extension exercises. The usual treatment is nonsteroidal anti-inflammatory drugs, rest, and phonophoresis. A condition in which the leg cannot be extended. It is usually due to displacement of meniscal cartilage or dislocation of the patella. The ligamentous, capsular, and muscular structures that stabilize the knee against varus, external rotation, and anterior/posterior forces. Disruption of these structures can result in posterolateral rotary instability of the knee. A medial alignment of the femur and tibia of less than 180°. A lateral alignment of the femur and tibia of greater than 195°. The hinge articulation between the lower end of the thigh bone (FEMUR) and the upper end of the main lower leg shin bone (TIBIA). The knee cap (PATELLA) is a flat bone lying within the massive tendon of the thigh muscles and is not an intrinsic part of the joint. the joint between the femur and tibia of the posterior limb in higher vertebrates. a stem joint in grasses. a root emerging above ground or water level in trees inhabiting wet areas. Knee injuries may be induced by transverse-plane compensation for structural deformities in the lower leg or foot. n a joint complex that connects the thigh with the lower leg. It consists of 3 condyloid joints, 12 ligaments, 13 bursae, and the patella.